>>CLICK HERE for more information!<<! My son wearing his unique QR code at the Chamblee fireworks in 2014. My boy is a wanderer. After having a girl first, one that was nearly always attached to my side, I was not prepared for the terror of repeatedly having a child go missing in the blink of an eye. Now he’s 13 years old, 7″ taller than me and weighs 210 pounds. He doesn’t wander often. In fact, I can’t seem to get him to wander… away from his computer, that is However, we are still prepared; despite the repetition of safety-based social stories and the fact that he prefers to stay in his room… there is always a chance he will impulsively go seek something outside and get caught up in it until he’s no longer sure where he is. There are also large events that we sometimes venture out to, when the odds are stacked in our favor and we have all our tools to make it a successful outing, that breed great opportunities for him to be lost in the crowd. My son is verbal, but when something happens to him that deviates at all from his normal routine, he shuts down. He knows his name, address, and phone number, but when he’s in distress all he can process is what’s happening to him at that moment. He doesn’t think through asking critical questions or seeking help, he either shuts down exactly where he is or he goes. Like Forrest Gump goes – no idea where he’s going or what or who he’s trying to reach, he just goes. So how would you respond to a 210-pound, stocky man child (that sometimes wears diapers because of crippling digestive and bowel issues) that cannot tell you his name, where he lives or what’s wrong? As a parent, I have researched myriad IDs and tracking devices for my child. I’m glad to see so many options available now – so many other parents stepping up to the plate and inventing products to keep their children safe. My son has extreme sensory issues (and I mentioned he’s a 13-year old boy)… he rarely keeps CLOTHES on. A clunky tracking device on him would not be there long. If I Need Help has saved our bacon on more than one occasion! First of all, the creators are super cool, funny and awesome parents who, like many others, had a dire need to keep their own child safe. Secondly, the QR code patches and clothing were easily tolerated by my son! He actually loves the idea of having his own unique “code” and wears it with pride. We didn’t make it to fireworks this year. The ones that went off in our neighborhood ALL DAY really put him into a bad sensory state. 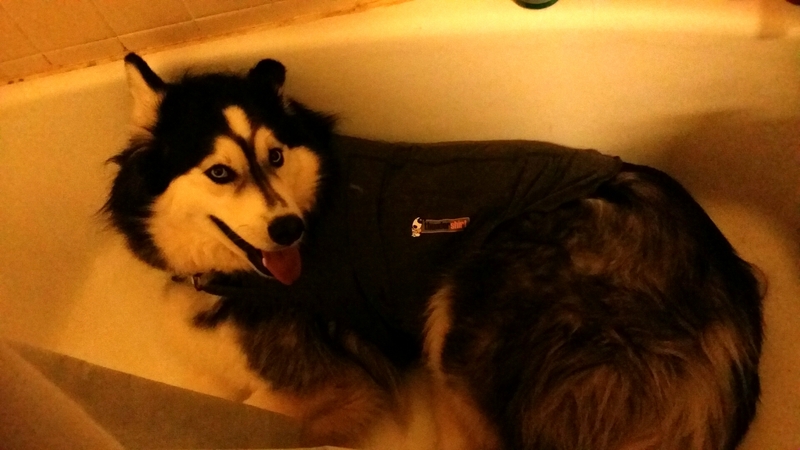 Together, with our terrified, Thundershirt-clad husky seeking shelter in the tub, we focused on calming routines instead of venturing out to the city’s festivities. ‘Twas quite a night. Last year, however, we went to the City of Chamblee fireworks and had a great time! 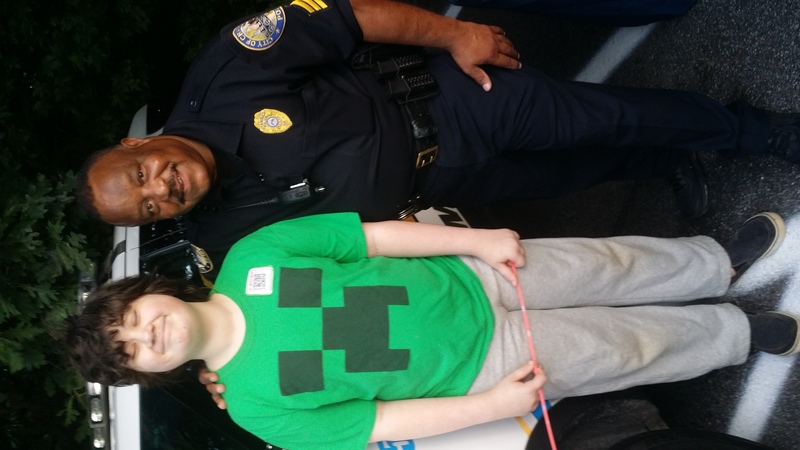 Donning his QR code on a Minecraft shirt, our first stop at the festival was the police tent, where I introduced my son, explained he was Autistic, and told officers if they spotted him anywhere without me, they should scan his code with their smartphone. 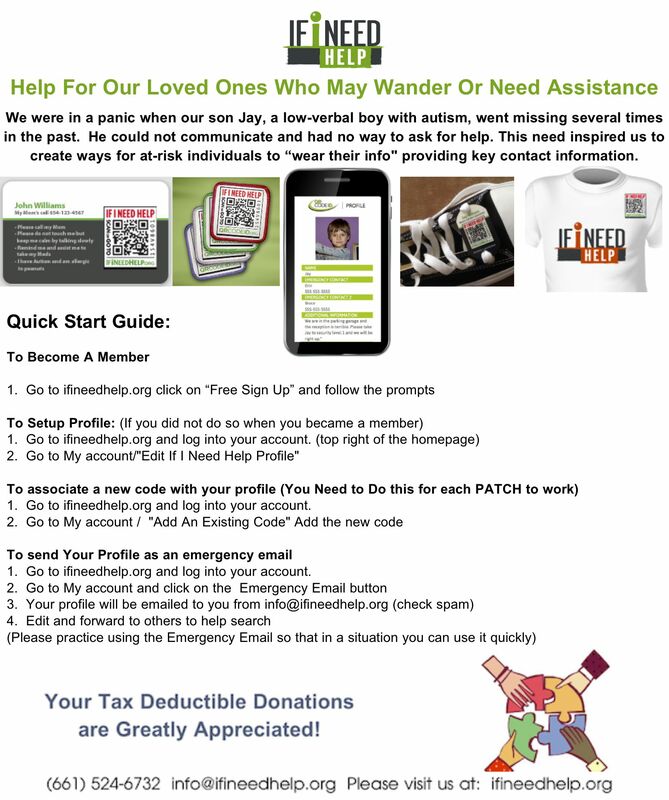 The QR code gives instant access to my son’s emergency information, I am able to change anything in his profile REAL TIME based on the scenario, and the entire thing can be emailed to searchers if he went missing. It is his unique ID, a way for him to communicate when he isn’t able. One time, he was playing with the hose in our front yard and his sister apparently told him to get lost. Being literal like he is, he did just that. In the blink of an eye he was gone – no shirt, no shoes and soaking wet. It took a neighborhood search party, DeKalb PD and a lot of faith that day, but I got my son back safely. He wasn’t wearing a shirt, so how could the QR code have helped? 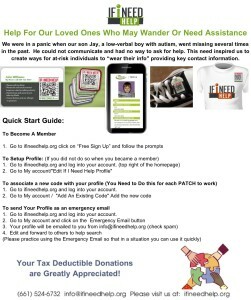 If I Need Help has some NEW products – they now have custom Dog Tags and ID cards that have the name, number and additional info printed on them along with the QR code. People who are more independent like these, but they are also good for people who do not keep their shirts on. 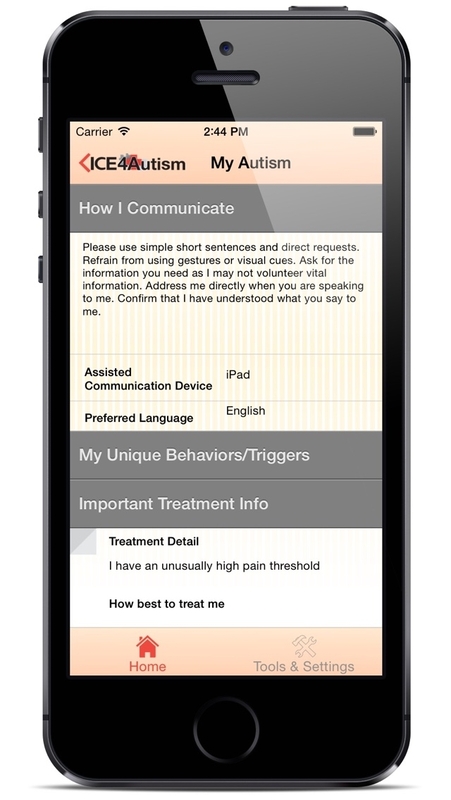 With the free sign up you can create a profile, edit it live in real time, send the profile to other caregivers, and print out your own code. Many people are printing their codes, laminating them and taping or glueing them to their phones, devices or anything else they keep with them regularly. If you’ve taken my Autism training course, you already know some signs and behaviors that will help you identify that someone may need help. Keep your eyes open for anyone wearing or holding a QR code on their person and don’t be afraid to SCAN IT! You may just be saving a life. I’m so excited to have connected with Wanda Refaely, creator of ICE4Autism, the only Autism-Specific In Case of Emergency (ICE) App. 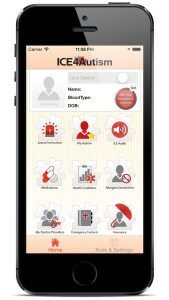 This awesome app provides first responders and medical personnel with actionable information quickly and effectively. ICE4Autism can also send an emergency alert text message — including your GPS location and a link to your location pinned on Google Maps — to your designated emergency contacts. Parents, spouses, caregivers and service providers can come to your side, advocate for you and help you through the ordeal. simply launch the ICE4Autism mobile app and you as a first responder, ER doctor, nurse or administrator have immediate access to the critical the information needed to treat the patient properly while helping to reduce what is sure to be a heightened level of anxiety. Emergency situations are challenging for everyone. But add in sensory, communication and behavioral challenges, and an emergency can turn into a disaster for a person with Autism and the responders trying to help them. Below is the video interview I did with Wanda, as well as the screen shots she mentioned in the broadcast. Please feel free to like and share the video, you’ll help more people be prepared for emergencies! Back in May of 2011 I had a huge problem. My son came home from school each day with holes in his shirt. He destroyed countless pencils, board game coins, and “reusable” plastic straws. But the worst: the perpetual trips to GameStop to replace the myriad styluses (stylii?) that were nibbled to mere nubs. When KidCompanions Chewelry came to the rescue, I shared the exciting news on the Blog, especially because Chewelry saved me over $14.99 a month because I no longer had to buy replacement styluses. You can find the original review here. If your child chews incessantly, understand that it is not their fault. They can’t help it. Children with Autism especially have difficulty in regulating their sensory experiences. They can have hypersensitivity or hyposensitivity to various sensations. Excessive chewing is an example of sensory hyposensitivity. It’s been a while since Justin has been a human beaver and destroyed items by chewing. But we have other issues. 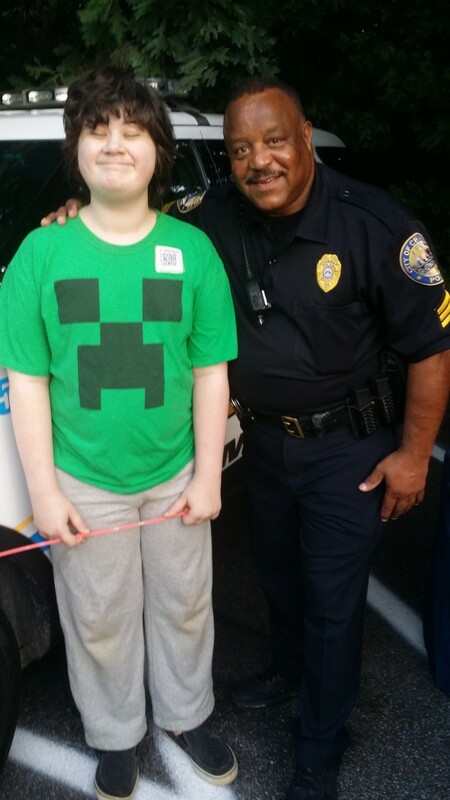 He spends a lot of time on his computer, playing Minecraft, writing custom video game scripts, Skyping with children all over the world. But he’s still an 11 year-old boy with a LOT of energy! Although we have a mini-trampoline, Gazelle Edge, yoga ball, and play time outside, he still bursts out of his room in regular intervals looking to spend his overabundance of energy SOMEWHERE. Many times I can redirect it to one of our exercise or sensory items mentioned above, but many times it’s not enough. His energy release of choice lately is messing with the dogs. It’s not pretty. We have three giant Alaskan Malamutes and boy does he know how to get under their skin fur. Rest assured, these giant pups are very tolerant and patient; it’s still not a good situation for anyone involved. 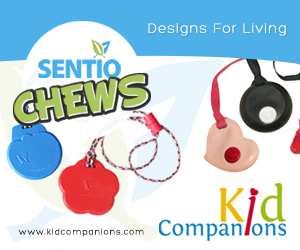 Enter KidCompanions’ newest item: SentioCHEWS. They are chewy shapes made with FDA compliant thermoplastic elastomers. SentioCHEWS are elastic, bouncy, AND tough! They have a soft, rubber feel and are pliable, NOT a hard chew like the KidCompanions Chewelry. SentioCHEWS are more durable than competing products that are made of silicone. The chew or bite marks bounce back and do not leave teeth marks easily. He LOVES it even more!! Now, with the addition of his favorite SentioCHEW in our toolbox, he is learning to overcome new challenges. Instead of just filling a sensory need, SentioCHEWS help him alleviate anxiety, address boredom, and actually provide repetitive, calming movement for him to tame some of that wild energy. What does this mean for our household? Less yelling, more productive activities. Even better? Less snarling, more tail wagging. Does your child chew incessantly? Check out Chewelry and SentioCHEWS today! My son was 18 months old. He was standing next to my bed, humming, as I was folding laundry and separating the piles. Then he walked out. In the time it took me to fold a pair of jeans, the child had walked to the other end of the house, found my keys, figured out which one was the car key (! ), went outside, opened the trunk, and climbed in. When he was in First Grade, I dropped him off at school, walked halfway to his class with him, then went on my merry way after kisses and high fives like usual. It just so happened that I forgot something from the house that day. Coincidentally, I also needed gas and went left instead of right, passing the school once again. About four blocks from the school, in a direction I normally never would have traveled, was my son, walking with his backpack and singing, without a care in the world. He apparently walked right out of the building after we parted in the hallway, and the teacher assumed he was absent that day. No one knew! Imagine what could have happened if I had turned right like I always did! Safety-proof your home. Home should be a safe haven. In addition to traditional childproofing for small children, you will have to take some extra measures for your child with Autism. Install door alarms. Many children with Autism are prone to wandering. Alarms offer great back up protection. Arm your child with a form of communication. Whether your child is verbal or non-verbal, communication is a challenge. Create a visual safety book for your child with key questions and answers he or she may be asked in an emergency situation. Practice, practice, practice! Get to know your neighbors. It’s a good idea to introduce yourself and your child to your neighbors. You can explain what Autism is, along with some of your child’s behaviors that would strike other people as odd. This way they will call you instead of the police, or help direct your child home if found wandering. Register your child with public safety. Contact your local police precinct, fire department, and hospital and register your child with their database of special needs families. Use social stories. Teach your child how to handle emergency situations like fire, burglary, strangers at the door, when someone is hurt, and calling 911. Get QR Code iD apparel for your child and subscribe to their website. What is QR Code iD? People who have Autism, cognitive disabilities or other special needs or health issues may be unable to state personal information such as name, phone number, address, medications taken, where Mom and Dad work, issues peculiar to that day, the hotel where the family is staying on vacation, etc. If your child is lost or wanders, rescuers need to know who to call, and how to help. QR Code iD creates a way to put this information in one place. This information is accessed from any computer browser, either by entering the URL manually with the computer keyboard, or by scanning a QR code printed directly on the child’s clothing, both of which will take you to the client’s non-secure homepage. This page displays all the information that a loved one wants someone to know when finding the child. This information can be updated REAL TIME! QR Code iD commissioned Special Needs Artists to create beautiful artwork to put on shirts, buttons, key chains and other products that have QR codes on them. These talented Special Needs Artists will be discovered and contracted to contribute original artwork for our products. Membership is only $29.00 a year for this invaluable service. I highly recommend it! Use “spirit 15″ when you check out for 15% discount through July 4! Do you have any stories of your child wandering that really frightened you? What did you do? Share your comments below or post them to the SOA Facebook page! I’m so proud to be a part of this fantastic new resource, a monthly digital autism support magazine known as autism Oz. 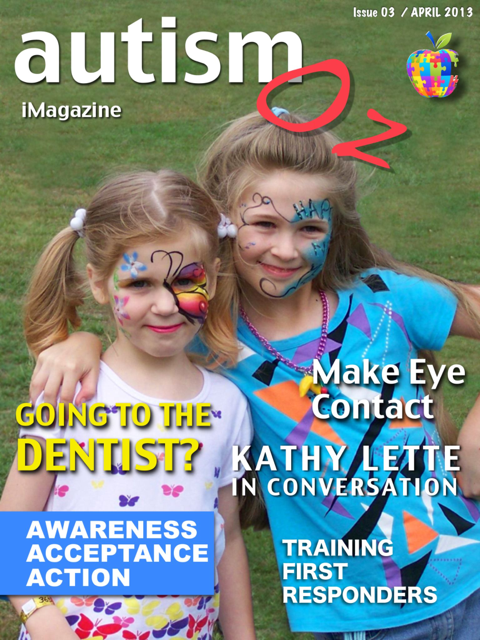 It was given the name because the magazine is produced in Australia (Oz) but aimed at the global autism community. They have a fantastic team of contributors (including me *wink*) who are highly respected scientists, therapists, nutritionists and parents living autism’s day-to-day experiences. These contributors bring the latest and most innovative news, views and tried and tested advice from across the autism spectrum. autism Oz uses the Internet’s interactive ability to create magazines that come alive and serve the community. In addition to written content, videos can be played straight from the pages of the publication. What drew me to this project was that families are be able to connect from all over the world and share their own stories and video of struggle and success. Much like Spirit of Autism, the messages are REAL, uplifting and authentic. I was introduced to the Editor, Iain Croft through LinkedIn. He’s a former journalist with the BBC in London, where he worked for 23 years. He was Assistant Editor at Hardtalk on World TV, Planning Editor at World Service Radio News Programmes, and Assistant Editor at the BBC’s most influential news and current affairs program called “The Today Programme”. Now living in Perth Australia, Iain is a parent of three wonderful children Riley (sadly deceased), Isabella who is six and Rafael, five. It is because of what happened to his son that he has now put his energy into child welfare and helping parents assist children reach their full potential. This was his inspiration for birthing this major project aimed at people with autism and their carers. I’m honored to be a contributor to autism Oz iMagazine. You can find my article on why I train Emergency Responders and Autism Safety at home in the April issue. Once I got to know Iain and his driving force to help the community, I immediately volunteered to create and manage the magazine’s website. autism Oz is more than a project, it is a global movement. It goes beyond autism awareness; it is autism in action. Whether you are just starting out on your autism journey or if you are a seasoned professional, autism Oz is with you every step of the way. After reading Step Ahead of Autism by Anne Moore Burnett, I felt that the stories and tools provided were so thorough and practical that I had to break up my review into two segments. This is Part II of my review. In each step Anne shares a part of her story and then turns her experience into practical tips and exercises for us to practice immediately. Step six is ADVOCATE. Here is where we journey with Anne into her first IEP meeting experience, which wasn’t smooth by any means. She openly and courageously shared how she was caught off guard, how she took her power back, and how she successfully created the right support system for her son. This chapter also offers a complete IEP Checklist, so we can learn from her experiences and show up to our own IEP meetings armed with the right resources and tools. Bravo! A positive attitude enables you to look at what appears to be an impossible situation and find alternative ways to make it work. Step eight is ASSERT YOUR AUTHORITY. Boy did I relate to this chapter, as my own son is currently going through puberty as well. I learned some more about what is going on inside his body and how to truly listen to my intuition, despite what the naysayers in my life may proclaim. The doctor described how puberty is like a fire alarm going off inside your body, and how in children with Autism it amplifies sounds, smells, and crowded spaces, which can and DO reignite old behaviors. When our children endure these magnified senses all day they must have an outlet at the end of the day to release the stress. To make your child most comfortable in their environment will help them flourish. This may mean looking at different options for school, homeschooling, or other major changes. Follow your heart, and don’t let complacency, fear, and lack of motivation squash your authority. I am currently in complacency with my own situation, and because of this chapter I was able to recognize it and start making calls about some new supports for Justin. Step nine is DELEGATE. In this chapter, the author comes to the realization that she hadn’t been very active in ministering to her own needs because she was so focused on her child. Her tales of isolation due to public experiences with her child as well as judgment and questioning from others hit a very sore spot with me. I’ve been a single mom for eight years, so I very much related to not trusting others, feeling judged frequently, and doing everything myself. Chapter nine inspired me to merely consider opening my world (scary!) to others, including other caretakers and other parents. Step ten is ASPIRE. Programs like drama, art and music helped tap into the right brain of Anne’s son, which slowly softened the rigid edges associated with Autism. He also became part of a swim team, which grew him to be a part of a group, yet it still met his needs for a manageable world of synchronized order. The biggest message in this chapter is to find the balance between not hiding your child’s diagnosis but not letting it stand in the way of their progress. If we focus on the positive gifts our children possess, benchmarks will be reached and celebrated. Even independence may not be out of reach. Anne wraps up this masterpiece with real life examples of how she put the steps into practice, letting us see that these tools are practical and tangible. She helps us determine our own milestones and gauges for success, and gives us permission to continually reassess along the way. That’s really what it’s all about – the journey. Anne has a website that offers much more in the way of resources, connections, and coaching. She also lays out the steps on how to start your own Step Ahead of Autism support group to help find strength, joy and encouragement with others on this path. I’d love for you to share what you thought of this book by commenting below or posting on the SOA Facebook page! I just finished reading Step Ahead of Autism by Anne Moore Burnett. I have to say this is one of the most inspiring and practical Autism books I have ever had the pleasure of diving into. As a researcher by nature, most of the books in my library discuss the biology involved in sensory integration dysfunction, the nutritional and behavioral repercussions of certain food sensitivities, and the implied neuroscience behind certain brain function as it relates to Autism. Anne’s story is a refreshing and honest tale of her journey with her son Joey, who was diagnosed at the severe end of the Autism Spectrum at age two and went on to become a successful college student. Most of my books require hours of focus, references, and frequent sanity breaks. Step Ahead of Autism was such a flowing and effortless read; parts of the author’s journey and emotional roller coaster mimicked my exact experiences and I relived some of those feelings. But the real magic in the book is the way it is broken down into ten practical steps with exercises, techniques and tips that can instantly be put into practice. Many of the ideas are of course pertaining to making the best choices for your child, but the real inspiration is the transformation we make within ourselves – shifting our intentions, beliefs, attitudes and reactions to the diagnosis and the choices we face each day. That being said, there is so much amazing information in this book that I will be only discussing the highlights of the first five steps in this post – Part II will be posted next week. 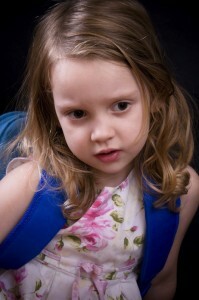 She further states it is time to leave the “Why does autism occur” to the researchers and to move forward. YES! This book is more about the changes we must make in ourselves and the skills we need to develop rather than trying to change the behaviors in our child. Quite a fresh perspective! Step one is TRUST. We must learn to quiet the noise of our daily lives and really reflect and pay attention – we know our child best and we must trust and explore creative solutions and limitless possibilities. She says it best that we tend to “fall into a trap of reacting to life and coping with what happens instead of actively creating a life that’s right for us.” I know this in my heart but I need daily reminders! Especially with a To-Do list that on some days seems longer than Santa’s “nice” list! Step two is OBSERVE. The author suggests creating a timeline of your child’s behaviors with dates that you can then take to doctor visits and eventually evaluations. This will serve as the framework and ease the intake process when specialists, therapists, and other providers are to be seen. Neither reaction sat right with me: the first lot telling me there is nothing wrong while I was clearly struggling with day-to-day routines and public outings, and of course no parent wants to hear that there is “something wrong”. Yet receiving the diagnosis had such a finality to it, and it definitely hit me like a Mack truck just like the author shares in her experience. One of the exercises in this section is to simply unplug from the electronic world and be in the now with your child. Focus and concentrate on everything they are saying and doing with you. I recommend that for everyone, not just your child! Also included is a thorough prescreening checklist. I really wish I had this before my son was five! Step three is ACCEPT. Grieving is necessary – it is natural to mourn your child’s diagnosis and eventually let it arm you with a sense of new confidence. Unfortunately, many parents are stuck in permanent grief, as if an Autism diagnosis is a life sentence. We must accept the challenge as an opportunity to realize and grow our capabilities as parents. By focusing on what’s right more than what’s wrong we can empower ourselves and inspire others, as the author has done with this book. Step four is ASCERTAIN. I did not have the gift of early intervention, but that’s ok. My son experienced several misdiagnoses before we arrived at the true picture. My journey and desire to learn more about my child rather than go with the first explanation and suggested treatment made me who I am today. This chapter does provide a strong argument for making early diagnosis and intervention the primary goals of every parent, pediatrician, educator, and caregiver. She also offers clarity on what you should look for in the assessments you may schedule for your child, and also some classroom concerns to gather when starting to develop a needs assessment. I hope Part I of this review has sparked your interest about things you can do to ensure the best possible outcome for your child. Even though I live Law of Attraction and carry a positive attitude in my pocket (which I sometimes forget to take out when I’m overwhelmed! ), Anne’s story has helped me go easier on myself and take a step back. I have a lot more power than I thought and I hope you know that you do, too! Yoga is a practice consisting of physical postures and breathing exercises that help to unite the body and mind. Yoga originated in India many centuries ago and is gaining great popularity throughout the world. Yoga’s benefits include stress reduction, inducing calm, muscle building, flexibility, and coordination. So these are yoga’s amazing general benefits, but what about our children on the Autism Spectrum? Aside from medical studies illustrating yoga as in effective treatment of neurological disorders and indicating that it increases motor performance of school children, the gains immediately related to physical and emotional symptoms of Autism are surprising. My child has low muscle tone. Trunk instability and low muscle tone affect not just coordination but stamina as well. The poses improve large muscle strength, which help increase the tone of their muscles. They also help mobility, which encourages confidence when joining peers in a physical activity. Gross motor delay makes my child appear awkward. An odd gait and delay in gross motor skills make these children appear clumsy, often resulting in teasing and being picked last for team activities. Yoga poses help your child become aware of where their legs and feet are in relation to the rest of their body, which helps improve coordination. What about missed milestones? It can be disheartening when your child seems to be missing out on what we consider typical activities for their age. My son cannot ride a bicycle, skateboard, and frankly he needs help with his “paperwork” after using the potty. When yoga poses are practiced consistently it allows children to feel more comfortable in their bodies, which carries over into all other aspects in their lives. How does it help sensory issues? I’m confident we are all familiar the sensory processing issues that accompany most children on the Spectrum. Yoga practice actually soothes the nervous system, allowing energy to be released from the body. With many of these poses, a child in sensory overload will experience his system being calmed, focused, and quieted. We need to be at home to use all our calming tools. Yoga is portable! Special breathing exercises are also virtually inconspicuous and can be practiced anywhere when the need arises. Choose a few of your child’s favorite breathing protocols and easy poses and you are now armed with a new tool to help your child in the world. Will yoga help my child make friends? There are certainly many reasons children with ASD feel isolated from their peers; whether it’s conversational struggles, narrow focus of interest, or anxiety from pent up emotions and sensory issues, yoga will help your child become calmer and more focused. From this new place, the mind is open to learning in a much more effective way. Don’t try to cure my child, Autism is part of who he is. Yogi philosophy places high value on individuality. Beyond the poses, students of yoga learn to accept themselves and celebrate the differences of others. Yoga is not a modality that will “cure” your child. It can, however, ease some of the struggles and help them accept their unique personality and behaviors. This, I believe, is the ultimate goal for our children to help them step into their best selves. SPECIAL NOTE: If you haven’t signed up for my newsletter, I encourage you to do so! This week’s newsletter reveals an entertaining story about why the police visited our house yesterday morning and the lesson I helped my child gain from the experience. I know I’ve already posted a blog this week, but this is too exciting not to share TODAY! I wanted to let you know about a great resource for special diets for this holiday season. My friend, Gigi, of GlutenFreeGigi.com has created a Holiday Guide featuring over 40 fantastic recipes, each with its own step-by-step How-To video! All the recipes are GLUTEN FREE CASEIN FREE and free from dairy, soy, and nuts! I can’t tell you how excited I am – this is an amazing and essential tool in my arsenal to help my son not be a Grinch this season because he has to eat “special foods only”. The Holiday Guide is full of tips and secrets for getting terrific results every time simply and affordably! If you’d like to learn more, click here! I was recently sent The Kitchen Classroom: 32 Visual GFCF Recipes to Boost Developmental Skills by Gabrielle Kaplan-Mayer and wanted to share how much my son and I love it! Having tried unsuccessfully a few times to go 100% Gluten Free/Casein Free at home, this book offers refreshing solutions and delicious, fun recipes to help make this an achievable goal for us. One of the biggest problems I encounter is purchasing gluten free versions of Justin’s favorite foods: they are twice the price and after one bite he declares that he hates it. Boom – out $7.00 for a box of Lemur Puffs. We excitedly welcomed the opportunity to make our own dishes that wouldn’t be compared to the handful of processed staples I’ve been gradually shedding from the household. The Kitchen Classroom is divided into three convenient parts to help you prepare for the experience of cooking with your child. I love the breakdown of the social skills benefits from creating a shared experience between child and parent. The introductory chapters go on to offer extremely helpful and realistic tips on framing your child’s success during shopping, preparing and cooking. Specific activities are spelled out to help develop fine and gross motor skills, assist with cognitive abilities, speech and language, and address sensory input issues. I especially enjoyed Ms. Kaplan-Meyer’s “Two Cents” chapter, where she discusses the importance of dropping the expectation to “cure” your child and focus on being present and keep growing and connecting your relationship through the challenges. Funny Face Toast – who doesn’t love to play with their food? Your child gets to use fruit to make faces on GFCF bread spread with nut butter. Mickey Pancakes – a little more challenging to create but offers a great source of essential amino acids and extra protein. Almond Butter Muffins – these delicious, rich muffins make a great breakfast, after school snack or dessert! Better Than PB&J – an exciting twist to your traditional, boring lunch fare. Very gooey! Mama’s Meatballs – my son doesn’t like getting his hands messy at all, but with medical gloves this recipe became a fun sensory experience! We did this one for restaurant night and it was a hit! Nut Butter Noodles – a quick, delicious dinner with a sweet taste. Noodles have always been a favorite, and with the pungent flavor of the sauce he doesn’t even notice that they are gluten free! Carrot Coins – cooked carrots mixed with honey, cinnamon and a bit of sea salt… need I say more? Favorite French Fries – I have very fond memories of my own mother’s homemade fries deep-fried to perfection. It’s wonderful to have a healthy substitute without sacrificing the flavor. Lemonade – what a pocketbook saver! Bye-bye endless boxes of Capri Sun and other sugary, dyed juices. Crispy Rice Squares – a GF version of classic Rice Krispie Treats from my childhood! Yes! Banana Chocolate Chip Bread – this recipe completely rid my previous perception of GFCF foods tasting “odd”, “boring”, or just plain icky. This is a very decadent dessert bread that doesn’t sit heavily on your stomach afterward. Delightful. Overall, the simplicity, easy to follow visuals, categories, delicious recipes, and bonus CD-ROM make this book a winner in our house! You can order Gabrielle’s book here. Let me know what recipes are YOUR favorite by commenting below or posting them on the Spirit of Autism Facebook page – I’d love to hear your opinions! Sign Up for Our Newsletter for Free Tips You Can Use in the Field! Buy a Sweatshirt... Support Autism Training!